"Nav" or "Nava" means "NINE" Graha is sometimes translated as "planet". 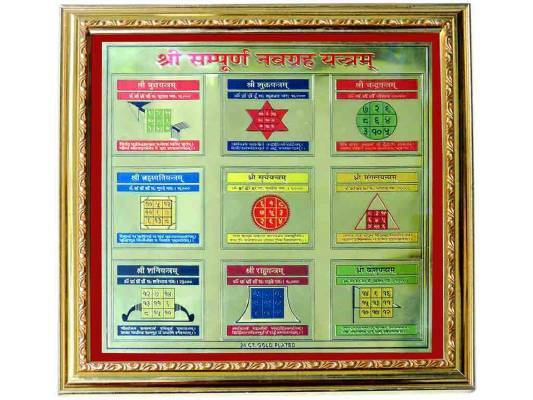 The Navgraha Yantra is one of the supreme and most significant astrological Yantra for being a single Yantra for all the nine planets in Indian astrology. It is the most powerful among all other astrological Yantras for carrying the powers of all nine planets together at one centre and so on it bestows the benefits of all nine planets to the worshipper. The Navgraha Yantra can be adopted by anyone around as no astrological consultancy is required here and as a deep believe, everyone should keep it at home in altar and include it in their daily ritual routine. In further articulation, keeping all the planets happy and pleased will definitely bring all the goodness and positive shades to the individual as they are the makers of our life path. The Navgraha Yantra comprises nine squares or cones or segmentation as each representing one planet and altogether expressing the divine potency of planets for providing all the positive reflection of celestial bodies to the natives of land. This Yantra is very beneficial for vanishing the malefic effects of planets and for enhancing the strength of well placed planets in horoscope chart. Carries the powers of all nine planets together at one centre. It bestows the benefits of all nine planets to the worshipper. Very beneficial for vanishing the malefic effects of planets. It provides success in all field associated with 9 planets.